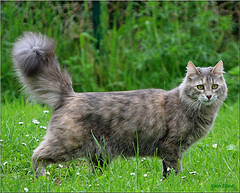 The CFA accepts the Turkish Angora cat in any shade and pattern, except those that denote hybridization (such as lavender, chocolate or the pointed pattern). Whites are still the most popular today, but these cats also come in other solid colors, such as black, blue, red and cream; in tortoiseshell or blue-cream; in classic, mackerel and spotted tabbies of many colors; and bi-colored cats in any of these colors with white. This breed originated in the mountains of Turkey, where it evolved with an unusually soft, medium-long coat, assumedly for protection against the harsh winters. 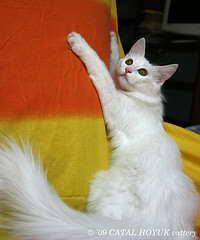 Fortunately, the Turkish Angora’s silky coat rarely mats and usually needs only minimal grooming. Most breeders recommend combing a Turk once or twice a week with a fine-toothed comb or very gently with a slicker brush. This is usually enough to remove excess hair and keep the coat in top shape. Like all long-haired breeds, they lose some coat during the summer months. At this time, more frequent combing may be needed to prevent excess shedding and to help prevent hairballs. One of the most loving and outgoing of all cat breeds, the rare and very beautiful Turkish Angoras are graceful, energetic and playful. Usually the first to welcome visitors to your home or start a game of fetch, these beauties are a joy to have around. While Turks are virtually unrivaled when it comes to playfulness and affection, they can be strong willed and need a firm hand in training. They seem to respect this and quickly form devoted attachments to their human trainers, lavishing them with purrs, kisses and much love. Fine boned, these cats are very strong and athletic. Good jumpers and mousers, playtime consists of chasing things, especially imaginary friends. The glorious coat is soft as finest silk and beckons one to touch and pet. Now available in many colors and patterns, this is the epitome of a showy cat. If one desires a glamour cat and a playful buddy, this is the cat to choose. Letting the Turkish Angora cat get the upper paw is the biggest mistake most Turkish Angora owners make. This cat is extremely intelligent and needs rules and boundaries to be firmly enforced to make the best pet. The up side of this is that the Turk is so smart, it is able to learn new things quickly and often remembers the names of its toys and sometimes will fetch the appropriate one when asked. This cat is a natural people lover and will befriend all visitors and family members. Good with other pets and respectful children, this cat will none the less insist on being the “Alpha” pet, and few other pets will usually argue that. Very loving, this kitty will follow his humans around in an almost dog-like fashion and will enjoy being included in family functions. This breed is happiest in a full household with lots of love and activity, or as the treasured only pet of a single person who needs some good interactive company.